Lay's announced the finalists for the stateside Do Us a Flavor contest a month ago, and we're still processing the existence of cappuccino-flavored potato chips. But the four final round contestants for Canada have just been selected as well, with the Great North's national dish front and center. 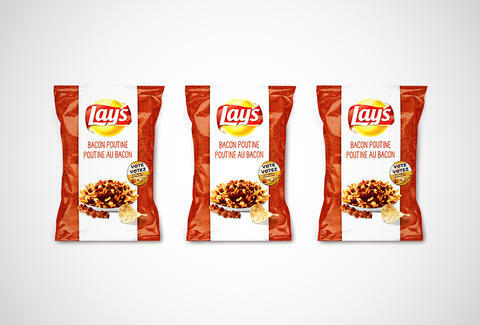 Beginning tomorrow, Canadians can vote for Bacon Poutine, Cinnamon Bun, Jalapeño Mac 'n Cheese, or Tzatziki to be crowned Lay's newest flavor. All four chips will hit grocery stores in the coming weeks, giving the hungry electorate plenty of time to sample the snacks before voting closes on October 15. Since it's only polite, as is the Canadian way, Lay's Canada has already awarded each finalist 5K in Canadian dollars (about $4,577 to us). The ultimate victor will get another $50,000 Loonies (about $45,770), plus 1% of all future sales. We'd say Bacon Poutine has this one in the bag, but those cinnamon roll scents have been known to claim many casualties. Kristin Hunt is a food/drink staff writer for Thrillist, and is actually super curious about the Tzatziki chips. Follow her to Canadian black markets at @kristin_hunt.